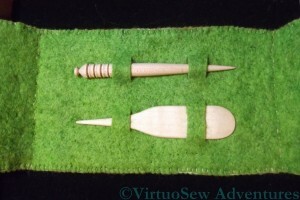 The last time you saw the case I planned for the wooden mellor and stiletto, I’d cut the slits and described how I finished assembling it, using chain stitch down each spine, and blanket stitch around the edge. When I put the tools in place, though, the whole thing seemed rather flimsy, somehow. I wracked my brains for a bit, and then thought that maybe if I were to needlefelt the layers together, it would give it a little more body. I have a needlefelting tool with five needles in a single holder, so I fished it out, and stared at it pensively for a while. Fortunately it has a plastic guard around the needles, so I left the tools in place, and needlefelted around them. From both sides. Then I took out the tools, and felted between the loops so that the fabric behind the tools would stay in place and only the loops themselves would be free of the backing. Finally, I needlefelted around the edge of the sampler panel and across all of the back, so that the whole case would have the same sense of solidity. Here is the finished piece. You can zoom in on the picture to get a better view of the stitches, and the needlefelting that gives the piece its body. I’m very pleased with how it turned out, and I hope my cousin will have many opportunities to use it, and will find the sampler panel inspiring and intriguing. Brilliant! I am sure that your cousin will be inspired by her needle book. I like the texture of the needlefelting, what a great idea. What a great idea!! Its lovely and your cousin is very lucky!!! Felting was a very clever touch! This looks great. Your cousin will be thrilled. That’s such a lovely finish and the needlefelting was a great idea! It is fabulous – I am sure your cousin will be delighted with it! 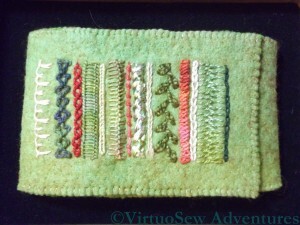 Such a lovely tool case with pretty stitches. Made with a lovingl heart. sigh…..turning green with envy here. This is such a beautiful, unique and special gift. Smart idea, Rachel! It’s lovely! The finished item is lovely, Rachel. Turns a thoughtful gift into something really special!